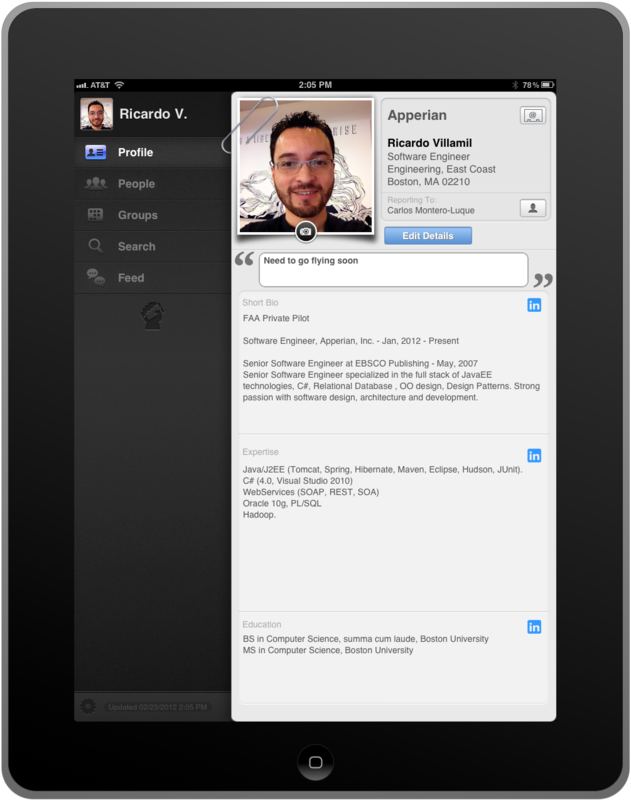 New mobile app powered by Apperian improves employee collaboration and knowledge sharing. Epicenter puts a human face on business and makes it easy to find and connect with coworkers. “As businesses embrace mobility, it becomes more and more challenging to locate and coordinate the key people within a company. Epicenter solves this problem,” said Reinhard Schumak, Director of Product Management. designed for the new mobile workforce. Epicenter, which works with the EASE Platform but is available for purchase and works separately, addresses the growing problem of keeping mobile workers connected, by improving employee communication, interaction and knowledge sharing. 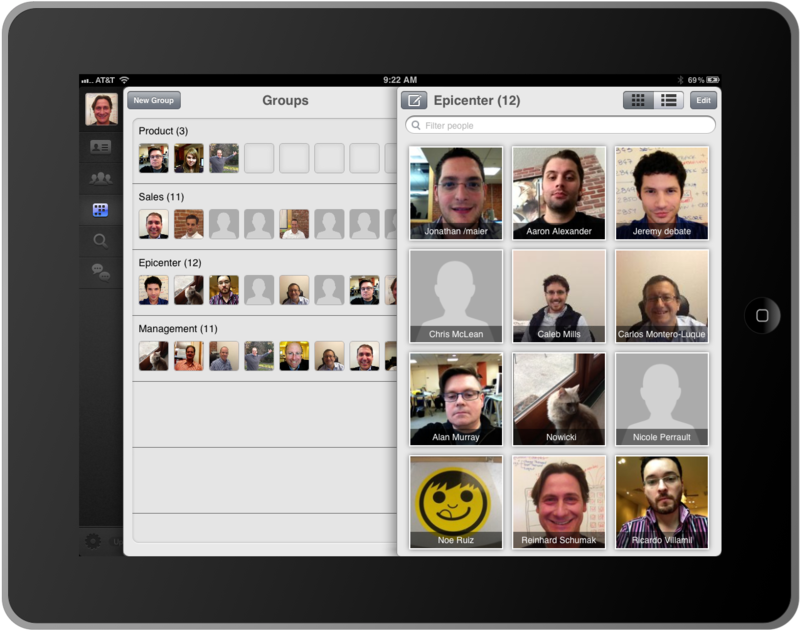 Built for the Apple iPad, Epicenter puts a human face on business and makes it easy to find and connect with coworkers. Epicenter represents the mobile world equivalent of the water cooler – all the information you need to know about the people at your company can be found there. Epicenter transforms the standard corporate directory into a social corporate graph highlighting information such as workers’ bios, experience and expertise. The product features LinkedIn integration and personalized profiles that give people the opportunity to discover each other’s talents. With advanced faceted search features, finding and connecting with a colleague has never been easier. “Epicenter is a beautiful and intuitive App that leverages the capabilities of the iPad to enable co- workers to visually navigate the organization, not just the org chart. We expect Epicenter to become one of the key mobile apps in business,” said Alan Murray, Senior VP, Products. Apperian, Epicenter, EASE and Mobility Transformed are trademarks of Apperian, Inc. in the United States and other countries. Other company and product names may be trademarks of their respective owners. 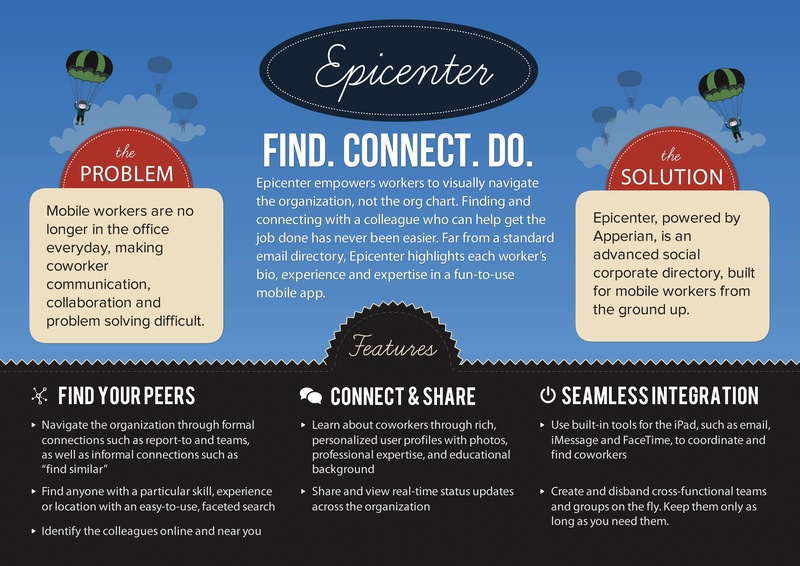 Epicenter makes it easy for workers to “find, connect and do” Epicenter features LinkedIn integration and personalized profiles that give people the opportunity to discover each other’s talents. 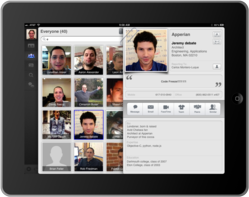 Epicenter is the world's first social corporate directory app designed for the new mobile workforce.